Controlling portions can be one of the hardest things when trying to lose weight. Meal delivery services are a great solution as you can order ingredients for 2 or 4 servings/meal. Thus you won't be tempted to nibble on leftovers! Having food delivered to your house helps prevent ordering take-out meals (which can eat up your daily calories way too fast). Knowing what you are going to eat ahead of time allows you the option of reverse engineering your calories for the day. Before you order your meals you'll have access to the calories/macros per serving so you can plan ahead. That way you can enter your dinner calories into MyNetDiary ahead of time, allowing more accurate budgeting information for that day's breakfast and lunch. All 3 companies we tried provided calorie and macronutrient information for their meals. This allows you to research the meal options at least a week ahead of time and order the lowest calorie choice. Meal delivery services certainly win an award for convenience. It takes next to no time to sign up for the service and within a week you can start receiving all the ingredients needed for the meals you selected. Each meal delivery service offered recipes to prepare containing whole foods. It is well known that fresh, whole foods from plants or animals contain more nutrients compared to most packaged, processed versions. The meal delivery services made eating whole foods that much easier! Foodies will enjoy trying new recipes and food combinations. The meal delivery services provide you with the opportunity to experience a different culture through food, without leaving the house. Sun Basket® meets the needs of those with different dietary preferences. For example, they offer diabetes friendly, gluten free, paleo and Mediterranean meals. I found all 3 services provided decent cooking instructions. Blue Apron® meals seemed to be the most complicated and time consuming to prepare. On average, the prep and cook time totaled 45 minutes. I was glad I had experience in the kitchen when we used their meals, as it helped me feel more confident that I was on the right track. Meal delivery services are great for someone who is feeling like tackling cooking yet wants support in the kitchen. Or perhaps you want to invite a special someone over and impress them with your cooking skills? Finally, it is easy to track all these meals in MyNetDiary tracker. In fact, many meals are already entered into the MyNetDiary database. With convenience comes added expense. On average, each serving was between $10-15. 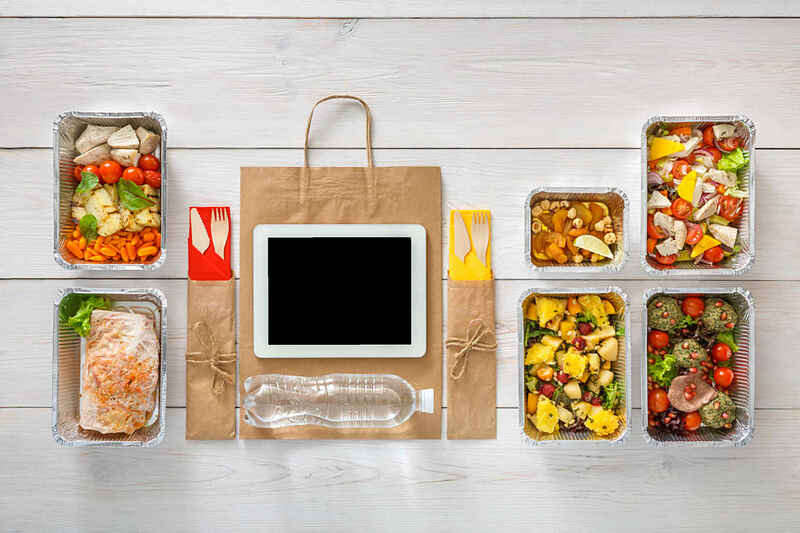 Many meal delivery services offer promotions, so you may be able to try out one of the services for less money. It is true, the meals do arrive in a lot of packaging. With that being said, the meat and fish always arrived cold and the veggies almost always looked fresh. Some of the recipes were higher in calories and carbohydrates than I'd prefer. Make sure to take that extra minute to read the nutrition facts before placing an order. I really enjoyed the Sun Basket® meals because you could find a tasty meal that was lower in carbohydrates. I also appreciated the organic vegetables and the option of adding organic meats. My biggest complaint with all 3 companies was the veggie situation. I tend to eat 3+ servings of veggies at dinner and some meals contained only 1 veggie serving per meal. After a few meals we started to add a cup of steamed veggies that we purchased at the grocery alongside each meal delivery service meal.